After donating my teenage memory of ‘being flashed’ to the Secret Stirchley crew at the pop-up arts tearoom, this weekend my embarrassing memory became the stuff of a Stirchley promenade street theatre narrative. 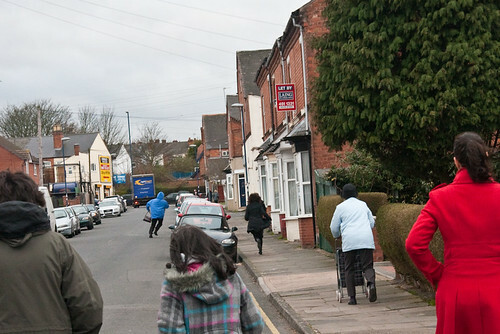 Performed by three actors as part of the Inhabit programme of pop-up tearooms, the stories they had collected from Stirchley residents over the past five weeks were woven into a narrative, relived and professionally delivered by actors as we wandered around the local streets. In this environment, it was hard to tell who was part of the show and who was incidental. – and to a young girl who was once flashed by a man standing in the reeds of the River Rea, followed by the ensuing police visit asking for rather intimate details and distinguishing marks. While I enjoyed the show, however, I’m not sure Stirchley is quite ready for such artiness – a feeling which was underlined by two events ahead of the opening Friday performance. 1. 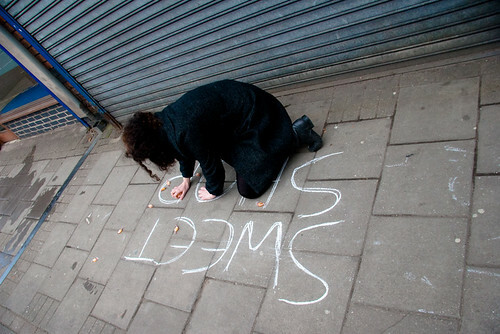 The neighbouring solicitor had apparently thrown quite a wobbly about a bit of chalk saying ‘Sweet shop’ on the pavement outside his shop (which was, you’ve guessed it, formerly a sweet shop). He told them he was trying to conduct a ‘proper business’ and was insistent that they remove it, which they did despite this being a public pavement. His uncompromising reaction seemed unwarranted – especially since the passing promenade didn’t even raise the two front-room workers’ heads as we passed by. And yet his over-reaction forms another B30 tale as I had been to see them the day before and now feel quite disinclined to do business there. Stirchley may be strong in community spirit, but at the same time it has always had its bullies, though maybe that is too strong a word – perhaps he was just having a bad day. 2. The second incident happened when a passing young mum with a pushchair had to be reassured that the mugging wasn’t real, just in case she didn’t spot the unconcerned crowd and phoned the police. 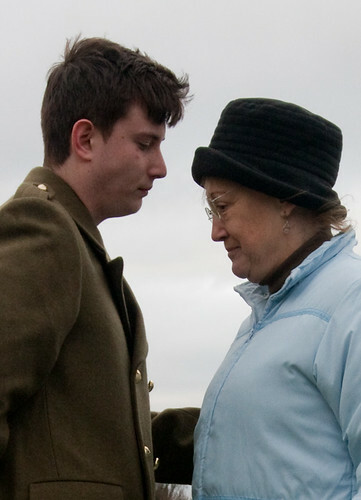 Personally, I think the show would have worked better for me as a direct documentary of Stirchley memories, flowing between characters but without the narrative hook. 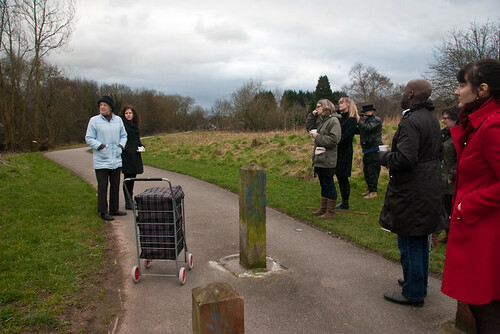 I suppose I wanted to focus on Stirchley and wanted to hear other people’s memories. I don’t think they needed the plot device, or perhaps I was slightly distracted by the fictionalised performance, which made the memories seem less real somehow. Still, I have very much enjoyed the tearoom over the past few weeks and I think it will be missed in Stirchley, which is a high street of diverse businesses but none of which offer a particularly sociable stop-off or gathering place (unless you like to go to the pub in the daytime or the ‘Society Cafe’ in the Coop, that is). The tea-room now moves to Hodge Hill. Lucky things. But I hope that it – or someone else with community spirit – moves into our empty shops soon. If you want to catch a performance of Secret Stirchley, there is one day left to see it – at 1pm and 4pm tomorrow (Sunday 13th March). Performances are free and start at the shop, on the corner of Ivy Road and Pershore Road.